Most people go to a nearby hotel or a dhaba if they crave for tandoori chicken. But what if I told you that you can make tasty, succulent tandoori chicken at home and that too with minimum oil? All you need is an Airfryer or an oven which is a blessing to all modern households who care about healthy eating. If you want to make this dish on the weekday, you can marinade the chicken and freeze it. Then whenever you wish to make, just de-freeze and pop the marinaded chicken in the Airfryer, make some dal, roti and salad to go with it and a complete, balanced meal is ready in a jiffy. The term tandoor refers to a variety of ovens, the most commonly known as a cylindrical clay or metal oven used in cooking and baking. The tandoor is used for cooking in Southern, Central and Western Asia, as well as in the South Caucasus. However, these days a variety of ovens and gas based tandoors and Airfryers are available in the market and these can easily be used to make tasty recipes at home. Wash the chicken legs and make slits in them using a sharp knife. Add chicken in a bowl along with Ginger and garlic paste, lemon juice and some salt. Mix the ingredients for the second marinade, that is, Tandoori masala powder, roasted cumin powder, garam masala powder, red chilli powder, turmeric powder, hung curd, Kasoori methi, black pepper powder, coriander powder and some salt and pour it all over the chicken. Rub the chicken well with the marinade and allow it to rest for at least 2 hours. If you wish to cook the next day, freeze the chicken with this marinade. Preheat the Airfryer or a traditional Oven to 180degrees C.
Place the chicken in the Airfryer basket and baste with ghee using a brush. After about 5 minutes, turn the chicken and baste it again. Do this about three times. Airfry for about 18-20 minutes untlil the chicken is slightly charred and browned. 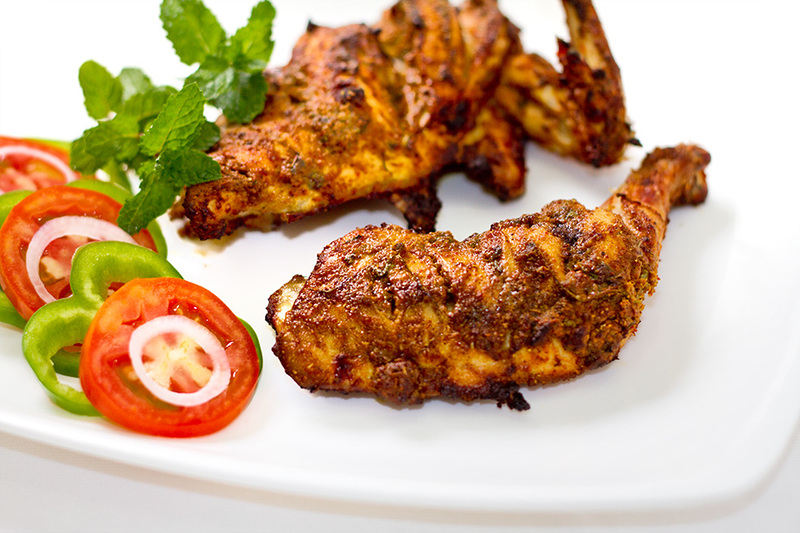 Serve this delicious tandoori chicken hot with yoghurt-mint chutney and tomato onion rings as a starter. If you want to make a quick meal out of it, pair the tandoori chicken with dal, roti and rice. Thank you, Manju. I am happy that you like my recipes. i bought an airfyrer recently. Waiting to make this and surprise my family! Wonderful. You will find Airfryer very useful. Do let me know how Tandoori chicken turns out for you and don’t forget to try my other recipes which use Airfryer. Am quite eager to try the tandoori chicken in the air fryer. Seems so easy and should be delicious with the masalas. Thank you, do let me know how you like it.